How long will terror reign? Has the American Horror Story TV show been cancelled or renewed for an eighth season on FX? The television vulture is watching all the latest cancellation and renewal news, so this page is the place to track the status of American Horror Story season eight. Bookmark it, or subscribe for the latest updates. Remember, the television vulture is watching your shows. Are you? Airing on the FX cable channel, American Horror Story, season seven, stars Sarah Paulson, Evan Peters, Alison Pill, Adina Porter, Billie Lourd, and Cheyenne Jackson. Season seven of this anthology horror drama follows the events of the 2016 US presidential election. A cult is terrorizing a Michigan suburb. The seventh season of American Horror Story averaged a 1.10 rating in the 18-49 demographic and 2.22 million viewers. Compared to season six, that’s down by 30% and down by 24%, respectively. Find out how American Horror Story stacks up against the other FX TV shows. On January 12, 2017, American Horror Story was renewed for season eight and season nine. Season eight debuts September 12, 2018. Stay tuned for further updates. Since FX already renewed it for seasons eight and nine, fans shouldn’t worry that American Horror Story will be cancelled anytime too soon. The ratings for season seven are down but it’s still one of the FX’s highest-rated shows. Subscribe for free updates on any American Horror Story cancellation or renewal news. Check the rankings for FX’s other scripted TV shows. Find more American Horror Story TV series news or other FX TV show news. What do you think? Are you happy the American Horror Story TV show was renewed for its eighth and ninth seasons? How would you feel if FX had cancelled this TV series, instead? 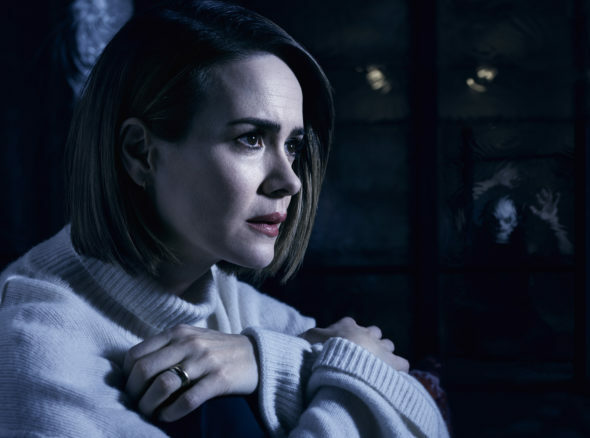 More about: American Horror Story, American Horror Story: canceled or renewed?, American Horror Story: ratings, FX TV shows: canceled or renewed?